A good mini stereo system will give you a good time, but the best mini stereo system should go beyond. You deserve the best, and your music experience should be unique and intimate. That’s the reason why we’re here with only the best models from the prominent leaders in the branch. The first item in our “best mini stereo system” reviews is Pioneer’s X-CM56B. The reason why we’re beginning our review with such a fine model is quite simple, actually. Pioneer’s X-CM56B excels in virtually all fields of performance, and it boasts quite a value for the buck. The first most notable feature of Pioneer’s X-CM56B is the built-in Bluetooth technology, 4.1 version. Even though it’s not the latest edition, it works like a charm. Furthermore, you could always use the one-touch setting to pair (or disconnect) this mini stereo system in a blink. Combined with the NFC (the near-field communication tech), this is one hell of a system. As for the other features, there’s a 94-millimeter cone woofer and 50-millimeter cone tweeter. Both of these features are top-shelf and capable of delivering premium-quality sound. Overall, this mini stereo system is truly something because it offers a great balance of affordability, versatility, and performance. Needless to say, Pioneer’s X-CM56B holds a huge value for the cash. Essentially, high-end mini stereo system models are not too affordable, but they offer exquisite features which are usually reserved for better systems. Such is the case with Onkyo’s CS-265 Hi-Fi mini stereo system. Basically, this one offers quite a lot if you’re prepared to pay top dollar. First of all, this is a 2-channel mini stereo system that features 20 watts per channel. You’ll be able to benefit from full digital sound processing with as much as a click of a button. Furthermore, other notable settings include EDA (efficient digital amp), and the NFC, Bluetooth connection stream. Keep in mind, though, that this setting will only work with NFC compatible devices. As for the general compatibility, Onkyo’s CS-265 Hi-Fi mini stereo system is capable of playing CD-Rs, CD-RWs, MP-3 encoded CDs, and standard Audio CDs. Furthermore, there’s a USB port that will allow you to playback audio from iPods, iPhones, and iPads. Now, the reason why this is one of the best high-end mini stereo system models is the super-bass function. This setting significantly enhances the overall bass output, making Onkyo’s CS-265 Hi-Fi mini stereo system perfect for parties. In short, you just can’t go wrong if you pick this one, but know that it’s not exactly cheap. Sony’s CMTSBT100 mini stereo system is one of the most valuable audio systems in our review. Basically, this system is quite plain and straightforward, it doesn’t cost too much, and it’s supplied with high-quality features. The classic design is the first thing you’ll notice, as it’s simple, yet beautiful. Apart from that, you’ll definitely love the powerful, dynamic audio capabilities of this remarkable mini stereo system. Apart from that, this system comes outfitted with the Bluetooth feature, and it’s capable of Bluetooth streaming (AAC, APT-X support included). As it’s only normal with great mini stereo system models, Sony’s CMTSBT100 mini stereo system also features NFC and one-touch controls. The only bad thing, however, is that the setup of this system costs extra. Plainly put, you’ll get a full package for a fair price, but the “expert setup” costs nearly as much as the system itself. Be it as it may, Sony’s stereo system holds a massive value for the money. Runner-up Best Value: Sony All In One Stylish Micro Music Stereo System with Wireless. Actually, this is a Sony bundle, not a mini stereo system. 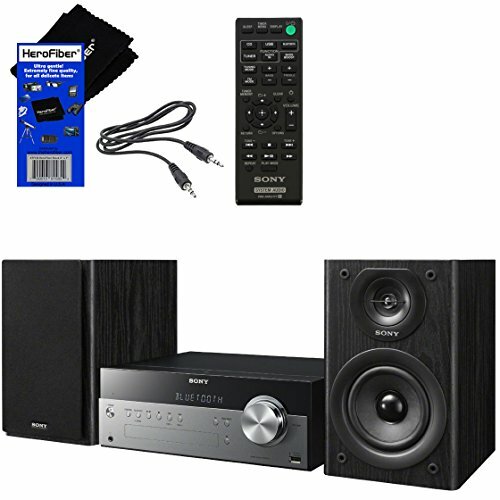 It includes the mighty Sony Micro Music Stereo system, a remote controller, a pack of AA Alkaline batteries, speaker pads, Hxtech CD Lens Cleaner, a special cleaning cloth, operating instructions, the speaker cable, the AM/FM antenna, and the auxiliary cable. All in all, there’s a bunch of complimentary features, and you should consider this option if you liked Sony’s CMTSBT100 mini stereo system. Our previous review mentioned the features of this remarkable mini stereo system, and this option allows you to utilize them even further if you’re prepared to pay extra. In short, this bundle is an extended variant of one of Sony’s best audio systems. Beauty counts, so it’s only fitting that we talk about those mini stereo system models that excel in aesthetics. Namely, RCA’s RS3697B Mini System is one of the most beautiful audio contraptions you’ll see. It boasts a beautiful, compact design that won’t take up too much of your space. Additionally, it will look amazing wherever you put it. As for the features, this is a Bluetooth mini stereo system that’s capable of Bluetooth streaming. Furthermore, this is a powerhouse with 100W of total power packed in full-range stereo speakers. The CD drawer’s there as well, right above the built-in AM/FM radio. RCA’s RS3697B Mini System is capable of “memorizing” up to 20 stations with this feature. 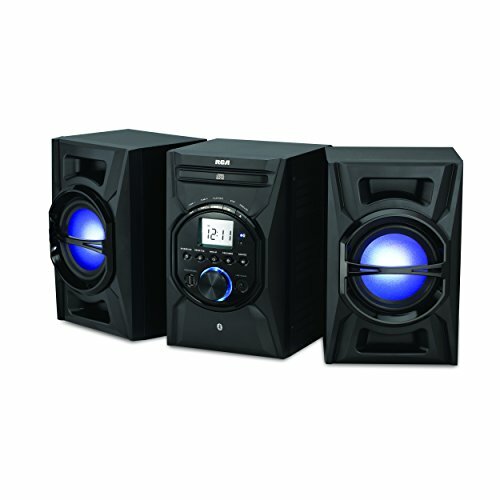 Generally, this amazing audio system holds a great value for the money due to its beautiful design and affordability. August brought us this amazing mini stereo system, and it’s absolutely great for the cash. 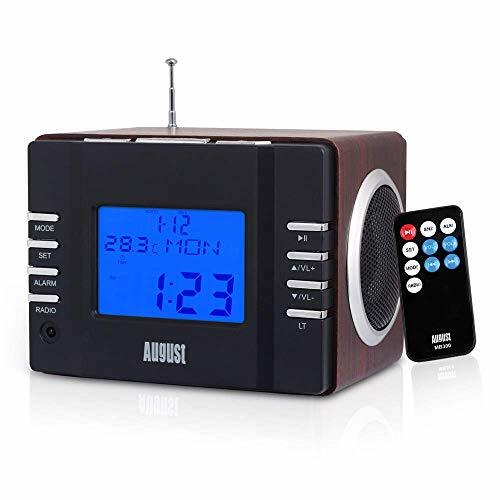 This little MP3 system features a FM radio, the USB port and SD card reader, and a little alarm clock with buzzers and radio modules. Even though this mini stereo system can only play music for about five hours, the internal battery is fully rechargeable. There are two powerful 60-millimeter speakers built inside the construction, but, sadly, they can’t compare to high-end sound systems. All in all, this is one of the most affordable sound systems out there, so its value is quite high. Colledge students are always down on cash, so we’ve included this special mini stereo system just for them. Essentially, Sony’s CMTBX20i mini stereo system offers a remarkable music experience for low cash. Its forte is compactness, as it features a beautiful, yet handy design. Apart from that, there’s a Built-in dock for iPods, as smartphones are remarkably popular amongst students nowadays. Furthermore, other features include a front CD player, and a fluorescent display. Basically, this mini stereo system is plain, cheap, and valuable. Here we have another Onkyo mini stereo system, the Onkyo CS-N755 Hi-Fi mini stereo system. In essence, this one costs quite a lot, just as the previous Onkyo system we’ve reviewed. Anyhow, there’s a world of differences between the two. First of all, this one features Internet Radio and Stream (ethernet connection), as well as a handy Bluetooth feature. Onkyo CS-N755 Hi-Fi mini stereo system can reproduce audio from Audio CDs, CD-Rs, and CD-RWs. This stereo system is also great for homes, as it supports Home Network Capability through DLNA. Other audio formats can be played via USB ports, including MP3, WMA Lossless, WAV, Flac, AAC, LPCM, DSD and more. Generally, this is the mini stereo system you want if you’re willing to pay top dollar. It excels in virtually all fields of performance, it’s beautiful, compact, and quite powerful, to be frank. The only downside is the price, but it’s easily compensated for by the manifold of benefits Onkyo CS-N755 Hi-Fi mini stereo system offers. One of the best things about Sharp’s XLHF102B hi-fi mini record system is that it features plain, but powerful features. Generally, even the “standard” model comes outfitted with high-quality bass boost, Bluetooth streaming, programmable features, and more. Apart from that, there’s always the “Hi-Res” option which will allow you to experience Sharp’s mini record system on a whole different level. 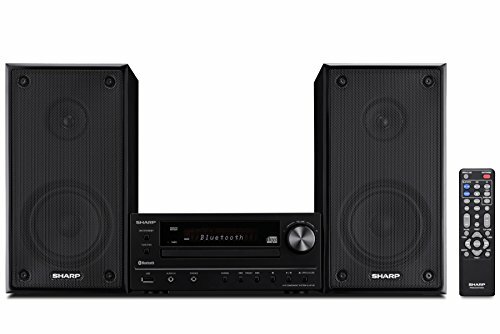 Namely, this audio system features USB inputs for MP3, WMA, and FLAC playback. Furthermore, the X-Bass™ boost brings only the best beats to your eardrums. We’ve already mentioned the Bluetooth Streaming option, but you’ll be delighted to hear that all Android & Apple products work just fine while using this feature, unlike some basic stereo systems. Overall, Sharp’s XLHF102B hi-fi mini record system holds a tremendous value for the cash due to its superior features and excellent performance. Sony is famous for making beautiful tech devices, but they really outdid themselves with the Sony LBT-GPX555 mini stereo system. Basically, this particular audio system costs quite a lot, but it’s pretty valuable if we take into account all of the potential benefits it offers. 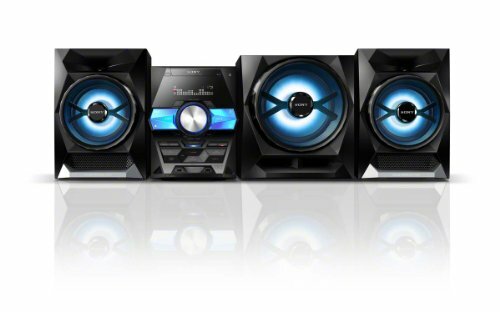 First of all, the 2-way bass-reflex system speakers feature a 10″ subwoofer. You can rest assured that you’ll get a unique bass output with it. Furthermore, the Bluetooth stream is a huge plus. Apart from that, the reason why Sharp’s XLHF102B hi-fi mini record system was labeled as one of the systems with the best design is the remarkable multi-color light show. Even though this mini stereo system costs quite a lot, it’s highly valuable for the cash.